Charismatic, Torquey Engine The SR400™ is powered by a 399cc, single-cylinder, air-cooled, SOHC, 2-valve engine that produces a torquey, “thumper” engine character that makes it an absolute blast to ride. Fuel injection gives the motor fantastic response and modern practicality. Light and Compact The SR400 weighs a mere 384 pounds and has a slim chassis and natural riding position with a low, 30.9-inch seat height. This combination makes for a machine that is well suited to both entry riders as well as experienced enthusiasts. Authentic Kick Starter Virtually unique among today’s street bikes, there’s no push-button starter. 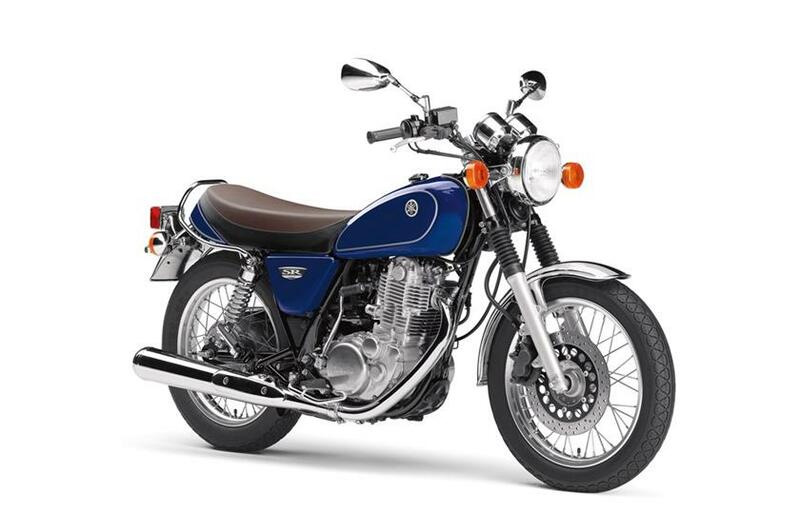 The SR400 is equipped with an easy-to-use kick starter as the only means of getting the engine running. That will draw smiles from old-school motorcycle fans and appeal to more modern motorcycle enthusiasts who value authenticity in their motorcycle. Built to Customize The Yamaha SR400 is the perfect motorcycle for both the custom bike builder and the rider who loves personalization. The SR is world renowned for its basis as the perfect platform as a Café or Street Tracker machine. Personalization and customization are limited only by the designer’s imagination.